John Carmack knows a lot more than I do about how videogames work, so his vote of confidence for Sony's new handheld speaks volumes. 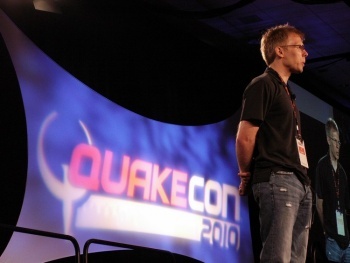 Cutting his teeth on some of the most revolutionary games of the early 1990s like Wolfenstein 3D and Doom at id Software, Carmack designs and programs the graphics engine that most of his games run on. His Twitter feed is often unintelligible for us laymen for his prevalent use of computing terms and jargon, in addition to esoteric mentions of fuel experiments for his rocketry side-gig (Carmack's Armadillo team won the X-Prize in 2008.) So when Carmack stated that he thinks Sony is doing the right thing with the NGP handheld announced today, I'm going to take his words seriously. "Low level APIs will allow the Sony NGP to perform about a generation beyond smart phones with comparable specs," Carmack's Tweet read today. I'm not 100 percent sure what that means, but essentially "low level APIs" give designers more control over how their application interfaces with the memory and CPU of a device. If that means that the Sony NGP will work even better than its specs might indicate, then that's certainly going to be awesome. What do you think? Will Sony give Nintendo and Apple a run for their money in the handheld gaming market with the NGP?